World War I Memorials are scattered across northern France and are well known and much visited. So it comes as a surprise to learn that new sites and new memorials from World War I are still being discovered and built, nearly a century after 'the war to end all wars.' The history of World War I has not yet been definitively written and it is doubtful if it ever will be. There is a real compulsion to understand and come to terms with World War I which has not receded with time. It comes from the feeling that we should never forget such a horrifying war but it's also very much due to both local and international research. The main battles of World War I were fought around Ypres in Belgium and a tour of World War I battle sites often starts there. But there's plenty to see further south in France around the attractive towns in the area. The discovery of 250 bodies around Fromelles has led to a new cemetery; there's a new memorial currently being constructed to Wilfred Owen, the poet who captured the 'Pity of War', and one individual who refused to give up in his search for a World War I tank now displays the Mark IV weapon in a barn at Flesquière. This mini-tour of three new World War I sites takes you from Lille southwest to Fromelles, south to Flesquières and then east to Ors. You can easily do this in a day from ​Lille, Arras or Cambrai. Fromelles is a little village around 11 miles (18 kilometers) southwest of Lille off the N41 towards Lens. On the way into the village, stop at the memorial to the Australians who died in the Battle of Fromelles. 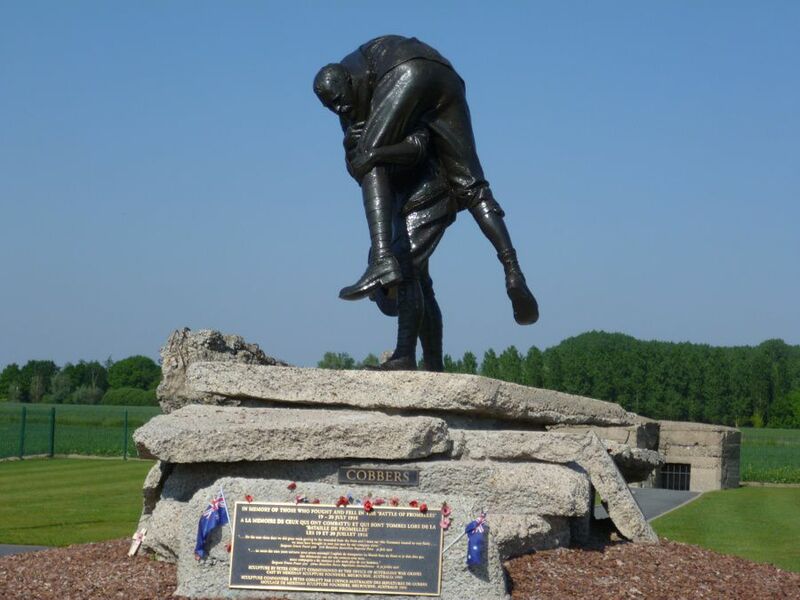 Drive past the striking statue of one soldier carrying a hopelessly wounded comrade, commemorating the numbers of Australians killed here and carry on to the new War Cemetery in Fromelles. This is the first new cemetery built by the Commonwealth War Graves Commission in 50 years and it marks the battle of July 19th, 1916. The headstones, arranged in the obligatory strict military rows, are bright and white and the memorial entrance is of smart, unweathered red brick. After seeing older cemeteries with their mellowed headstones, trees and flowers, Fromelles (Pheasant Wood) War Cemetery comes as a bit of a shock. The Battle of Fromelles was the first major World War I battle on the Western Front involving Australian troops and it was a disaster, made particularly raw for the troops by the fact that this was a mere sideshow to the Battle of the Somme. The 5th Australian Division suffered huge losses: 5,533 killed, wounded, taken prisoner or missing. The 61st British Division suffered 1,547 losses. At Fromelles it is believed that 1,780 Australians and 500 British soldiers died. While many of the bodies from the battle were buried decades ago in nearby peaceful cemeteries like VC Corner and Rue Pétillon, the discovery of 250 bodies in a mass grave in Pheasant Wood in September 2009 by the specialist company, Oxford Archaeology, was a huge breakthrough in the search for more of the dead of World War I. It was immediately clear that a new cemetery had to be constructed. The identification of the bodies has been an extraordinary process of forensic detective work, involving DNA from distant relatives and a huge research effort working with institutions like the Imperial War Museum in London. The remains of the dead were re-buried officially in Fromelles Military Cemetery in January and February 2010. On July 19th, 2010, the Cemetery officially opened, marking the 94th anniversary of the Battle. From Fromelles, a drive south of 50 miles (84 kilometers) takes you around Arras and Cambrai to the small village of Flesquières, deep in farming country. For six years, Philippe Gorczuynski, a local hotel owner, historian, and author, searched for a tank which an elderly lady had remembered being pushed by Russian prisoners into a huge hole near the café her family ran. Along with professional help, he eventually discovered the tank, Mark IV Deborah, in 1998 and had it dug up. This was just the start of the story as he began to research into the lives of those who died in the tank during the important Battle of Cambrai, November 20th, 1917 which involved 475 British tanks. It was the first test for this new form of weapon which was to have such a decisive effect on modern warfare. Philippe Gorczuysnki bought a barn in the village and installed the tank there with a small private museum in a small adjoining building. Deborah stood in the barn, isolated, battered and partly destroyed. Interest gathered and now Deborah is installed in a new museum beside the Commonwealth War Grave in Flesquières. Wilfred Owen, the English poet whose poetry about WWI had such an impact at the time and is still so evocative today, is buried in the cemetery of Ors, a small village near Le Cateau-Cambresis. It’s around 28 miles (45 kilometers) east of Flesquières, driving via Cambrai. The soldier-poet spent his last night with his fellow soldiers just outside the village in the dark and dank basement of the Forester’s House. Part of the Army encampment, this small red-brick house is currently being transformed in a particularly imaginative way into a monument to the poet. It all started with the efforts of the local mayor who, curious about the number of English who came to the village asking for information on the poet, contacted the Wilfred Owen Society a few years ago. He was so intrigued by the story and impressed by Wilfred Owen’s reputation and his poetry that he began to lobby for a memorial. 1 million euros were raised and the memorial opened in autumn 2011. In the village itself, there’s a sign beside the canal where the poet was shot, just 5 days before the end of the war. The skirmish happened where the road crosses the bridge over the slow-moving water. Further on the Wilfred Owen Library has a small section of books on the poet and the war. From here, it’s a short drive to the cemetery – not a large, official War Cemetery, but a peaceful, local one with a British corner devoted to the soldiers who died here. Every year, on November 4th, the village holds a memorial concert in the church and a reading of his poetry. It's called The Wilfred Owen Memorial.